A friend recommended The Fat Years by Chan Koonchung. The introduction and the notes to translation keep comparing it to 1984, though the text compares itself to Brave New World. My guess is that both the translator and the person who wrote the introduction, being Chinese majors, have a limited familiarity with English literature. They must have had to read 1984 in high school, but not Brave New World. 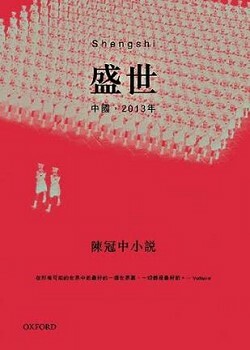 The novel seems popular in the West, to judge by the book reviews in UK newspapers, because it's by a 'dissident', it's banned in China, and it's perceived as being fairly anti-China. Only 'banned in China' isn't the same as 'banned in the UK'. I've seen an image of a copy published in Shanghai. So it's 'banned' but it's readily available. And it's not really anti-China. And the author says he has not been labelled a dissident. As in Brave New World (and very unlike 1984) most people in China in The Fat Years are happy. And, unlike both Brave New World and 1984, most Chinese are prosperous (in Brave New World, those destined for poverty were bred and conditioned to be happy though poor; in 1984, everyone who isn't a cadre is poor and miserable). But there is one aspect of The Fat Years that is like 1984: in China, the cadres control almost everything in print, just like Orwell's Ministry of Truth did in 1984. So the cadres deleted all records of a month in 2011, and somehow, almost everyone forgot that month. Older Chinese (both in the novel and in real life) distinctly remember 1989 and what happened at Tiananmen, even without anything in writing, but most Chinese in the novel cannot recall anything about one month in 2011. The book is about the search for that lost month. At the first ending of the book, the month is still lost, but then there's an epilogue. I quite enjoyed the novel. And the prediction of a collapse of Europe and the US, while it didn't happen as predicted in 2011, does not seem completely impossible. So The Fat Years is a worthwhile read.